Sister Sin have returned with Now and Forever and it’s a relentless old-school metal album with catchy choruses and sense of melody. Nothing hooked into my brain immediately like “Outrage” from True Sound of the Underground did but I’ve warmed up to the album after a few listens. It’s obvious the band is still delivering hard-crunching metal anthems with songs like “End of the Line”, “Fight Song” and “The Chosen Few”. Despite some mainstream coverage that band has received and the various “Hot Women in Metal” lists Liv Jagrell has been included in, I’m happy to see the band isn’t selling out and creating a sound that’s more commercial. Sister Sin is still straight up hard-crunching, raw metal and they don’t attempt that rock/pop crossover like Halestorm (another band that features a hot female lead singer) sometimes does. There is one ballad (“Morning After”) on the album but ballads aren’t anything new to metal bands. And it’s actually one of the better songs on the album. While I don’t want to ever see this band loading up their albums with ballads, I think they should definitely think about including one or two on the next release. This is a solid album that will not disappoint fans of the band. I still wasn’t sure if it was worth the money and checked out the thread as soon as I got home and the Myspace link that was inside and absolutely loved the song “Outrage”. I listened to most of this album on their Myspace page and some more positive feedback on this band convinced me to pick it up. I’m really glad I did. Sister Sin is like the slutty metal sister of Halestorm in a way. Liv’s vocals are powerful, not quite on the level of Halestorm’s Lzzy but very close. Both of these bands feature a strong female rock vocalist and have hooky modern hard rock sounds but while Halestorm has more of a post-grunge influence (and a bit of “Kelly Clarkson rock” on a few tracks), Sister Sin revels in pure old school sleaze & heavy metal and why not? They’re Swedish! It’s practically a legal requirement for any hard rock act from Sweden to pay homage to the ’80s glam and sleaze acts. Don’t get me wrong though, Sister Sin isn’t a retro band but their idols are obvious. While the Motley influence is there, they don’t necessarily sound like Priest, Scorpions and Accept but I definitely agree this band is for fans of type of music. However, there is an Accept connection after all– Udo Dirkschneider wrote the lyrics to “24/7”. As much as I love supporting the veteran acts, it’s great and refreshing to hear new bands coming up with their own twists on hard rock & heavy metal. 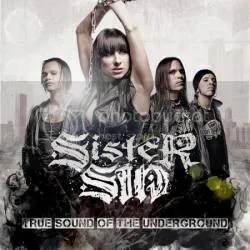 I wasn’t even sure if I was gonna enjoy Sister Sin just because I usually don’t care for female vocalists but True Sound of the Underground is yet another great release in 2010 and has been a featured album in my car and on my computer since I bought it. It’s hard, heavy, fast and it isn’t alternative. What more could you ask for?